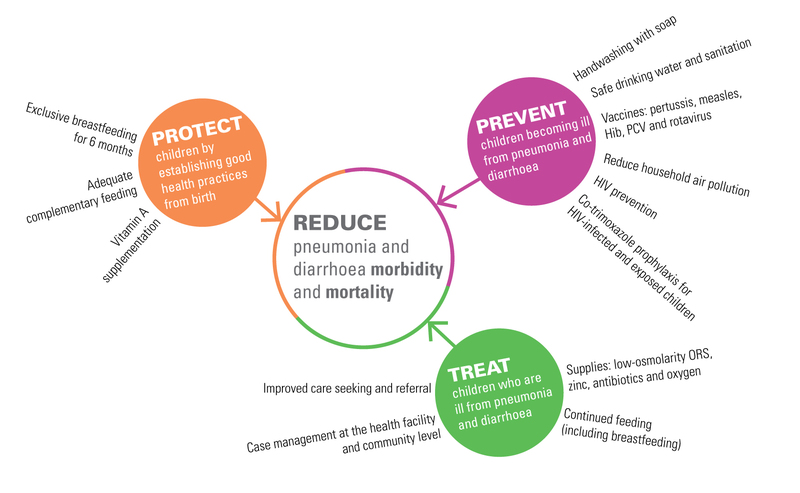 Diarrhoea is a leading killer of children, accounting for approximately 8 per cent of all deaths among children under age 5 worldwide in 2016. This translates to over 1,300 young children dying each day, or about 480,000 children a year, despite the availability of simple effective treatment. Most deaths from diarrhoea occur among children less than 2 years of age living in South Asia and sub-Saharan Africa. Despite this heavy toll, progress is being made. From 2000 to 2016, the total annual number of deaths from diarrhoea among children under 5 decreased by 60 per cent. Many more children could be saved through basic interventions. Exclusive breastfeeding: For the first 6 months of life, exclusive breastfeeding (without additional foods or liquids, including water) protects infants from disease and guarantees them a food source that is safe, clean, accessible and perfectly tailored to their needs. Nearly half of all diarrhoea episodes and one-third of all respiratory infections could be prevented with increased breastfeeding in low and middle-income countries. Adequate complementary feeding and continued breastfeeding: Good nutrition supports strong immune systems and provides protection from disease. From 6 months to 2 years of age, adequate complementary feeding – providing children with adequate quantities of safe, nutritious and age appropriate foods alongside continued breastfeeding – can reduce child deaths, including those due to pneumonia and diarrhoea. Immunization: The rotavirus vaccine provides protection against one of the most common causes of childhood diarrhoea-related death. Safe drinking water, sanitation and hygiene: Almost 60 per cent of deaths due to diarrhoea worldwide are attributable to unsafe drinking water and poor hygiene and sanitation. Hand washing with soap alone can cut the risk of diarrhoea by at least 40 per cent and significantly lower the risk of respiratory infections. Clean home environments and good hygiene are important for preventing the spread of both pneumonia and diarrhoea, and safe drinking water and proper disposal of human waste, including child faeces, are vital to stopping the spread of diarrhoeal disease among children and adults. Since 2004, UNICEF and the World Health Organization (WHO) have recommended treating childhood diarrhoea by replacing lost fluids through oral rehydration therapy. Along with continued feeding, oral rehydration salts (ORS) and zinc supplements are the recommended methods for treating diarrhea. Availability and accessibility of these treatments to all children, especially those in poor, rural and marginalized populations, could save the lives of hundreds of thousands additional children each year. These interventions have proved cost-effective, affordable and relatively straightforward to implement. However, worldwide, just over 40 per cent of children under age 5 with diarrhoea receive the recommended treatment of oral rehydration therapy and continued feeding. Coverage of this treatment package is lowest in the Middle East and North Africa, South Asia and sub-Saharan Africa (34 per cent, 37 per cent and 39 per cent, respectively). Sub-Saharan Africa and South Asia are also the regions with the most deaths from diarrhoea. Over the observed period, progress of this important intervention has been very slow. When it comes to specific use of ORS for diarrhea management, little progress has been made in coverage of this effective intervention. Available data indicate that just over 4 in 10 (44 per cent) of children ill with diarrhoea are treated with ORS, which represents only a marginal increase from 2000. Despite the global recommendation to include zinc supplementation for diarrhoea, global coverage of this intervention is extremely low with only 11 per cent of children with diarrhoea receiving it. There are a few exceptions to this rule in South Asia – namely Bangladesh and Nepal – but overall, much more needs to be done to ensure that all children are receiving both ORS and zinc as part of treatment for diarrhoea. Across all regions, ORS coverage is inadequate. However, children in urban areas are more likely to receive this recommended treatment than children in rural areas. Even among children living in cities and towns where health services are in general more available, coverage is far from optimal: 48 per cent of urban children with diarrhoea receive ORS. In rural areas, 42 per cent of children with diarrhea receive this life saving treatment. Globally, children from the poorest 20 per cent of households in their respective countries – those often at greatest risk of diarrhoea – are much less likely to receive ORS for the treatment of diarrhoea than children from the richest quintile (34 per cent vs. 45 per cent). However, even among the richest quintile, less than half of children suffering from diarrhoea are treated with ORS. UNICEF, Committing to Child Survival: A promise renewed – Progress report 2015, UNICEF, New York, 2015.
WHO and UNICEF, Ending Preventable Child Deaths from Pneumonia and Diarrhoea by 2025: The integrated Global Action Plan for Pneumonia and Diarrhoea(GAPPD), WHO, Geneva, 2013. UNICEF and WHO, Diarrhoea: Why children are still dying and what can be done, UNICEF, New York, 2009.
WHO and UNICEF, WHO/UNICEF Joint Statement: Clinical management of acute diarrhoea, WHO, Geneva, 2004. Diarrhea Management in Children Under Five in sub-Saharan Africa: Does the source of care matter? Diarrhoea treatment with ORS: Percentage of children under age 5 who had diarrhoea in the two weeks preceding the survey and who received oral rehydration salts (ORS packets or pre-packaged ORS fluids). Diarrhoea treatment with oral rehydration therapy and continued feeding – Percentage of children under age 5 who had diarrhoea in the two weeks preceding the survey and who received oral rehydration therapy (oral rehydration salts, recommended home-made fluids or increased fluids) and continued feeding.